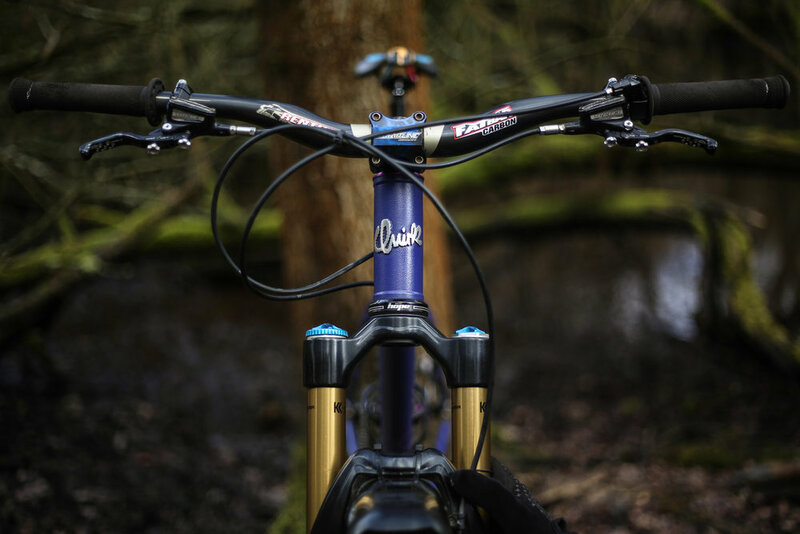 Chris's Trail Blazing MTB — Quirk Cycles | Custom Steel Bicycles Handmade in London by Framebuilder Rob Quirk. Chris had been searching for a steel MTB for a while but could never find one that did what he wanted in terms of geometry and design. Chris wanted something that would sit somewhere between a trail and XC frame, longer chainstays, steeper head angle and slightly lower BB. More importantly he wanted sliding dropouts so he could run single speed. We spent a long time refining the geo on this one to get exactly what he wanted and for sure it's not like anything else we could find on the market. You can see it's been ridden hard since he got it and the feedback is it's perfect. One more defining feature of this frame is the fillet brazed construction. Having asked around several steel MTB riders had told Chris you just can't beat the feel of a brazed frame, so that is what we went with. Also new for a Quirk are the un-filed welds because who needs a smooth weld when razing it through a forest! For the paint we went with something simple and tough - one colour rumble paint. Designed for industrial floorings, this paint can take a serious beating - perfect for off-road riding.